D16 is continuing its mission to update its range of effect plugins, this time announcing a second version of the Redoptor tube distortion. This brings new features, sonic improvements and more widespread plugin compatibility. 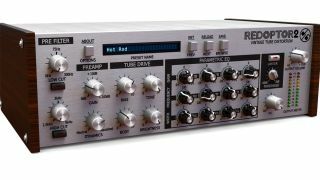 Redoptor 2 includes a preamp with built-in compressor, an output limiter and a parametric EQ with expanded frequency ranges. You get a tag-based preset browser, two alternative GUI sizes and MIDI learn functionality throughout. Until 10 November, Redoptor 2 will be available for the introductory price of €49, after which the price will rise to €59. It’s available for PC and Mac in VST/AU/AAX formats, and there’s also a demo for you to download. Find out more on the D16 website.